A neo-noir aesthetic, gruesome investigations, and pending showdown between Eliot Ness and superhuman cultists separate “The End of Peace” from its genre rivals. However, awkward dialogue pauses, no worthwhile choices, and an inexplicable alternate timeline stop this episode from surpassing them. 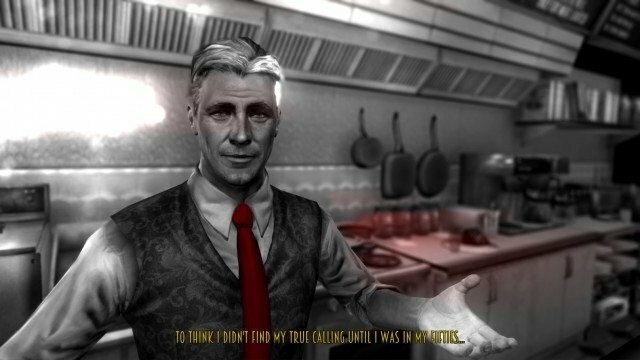 Blues and Bullets owes a lot to Telltale Games. The studio’s work on The Walking Dead revived mainstream interest in the adventure game genre, where viewers dictate how the story unfolds within a writer’s boundaries. Blues and Bullets‘ inaugural episode, “The End of Peace,” is no exception. Players pick up the trail of real-life detective Eliot Ness, 20 years after leading the operation that jailed infamous Al Capone. Now retired and managing a humble diner, a meeting with an old acquaintance convinces Eliot to put aside his apron and reopen a case involving kidnapped children and a mysterious sect. While Blues and Bullets adopts the episodic and choice-driven format of its peers, even a love of mobster eras and the occult cannot forgive how poorly this pilot pans out. You might say, however, that developer A Crowd of Monsters made a playable Sin City. Blues and Bullets reserves the color red for interactive objects or items of note: a girl’s shoes, religious sigils, blood. The rest of the color palette paints characters and locations in tinges of black and white, like that TV your grandparents insist on keeping. The neo-noir aesthetic suits a thriller of this type, in which the colors appear purer than some people’s hearts. Cops beat criminals mercilessly, gang bosses offer ironic ethics lessons, and once good men drown their demons in booze. “The End of Peace” establishes a morally shady view of the game’s fictional city, Santa Esperanza, by way of its art style. I hope A Crowd of Monsters maintains that ambiguity amid upcoming affairs. 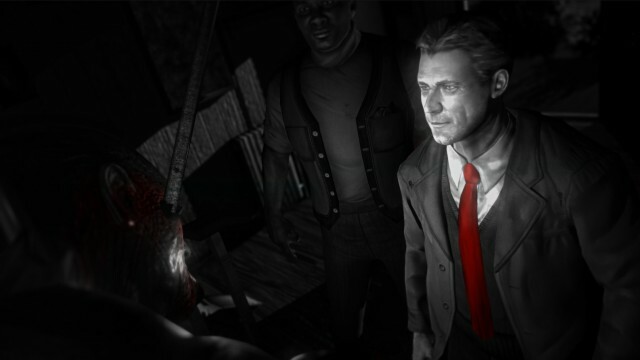 Blues and Bullets’ atmosphere depends on its shadowy tones, as does the story. It’s 1955, and crazed, skull-wearing cultists have been abducting local kids, including the granddaughter of Al Capone. Who can he count on to get her back? The same agent that spearheaded Capone’s arrest decades ago. Reluctantly, Eliot Ness has some stake in the case as well, since he never cracked a prior outbreak of missing children. And yet the developers, who claim to honor all the people and events they were able, disregard historical facts. Capone died in 1947, for one, and why not set Chicago as the backdrop? Why did the volatile Hindenburg survive a fiery demise in this universe? Why then rebuild it as a resort for the corrupt and/or famous? Unless future episodes provide insight, these liberties make little sense. As it stands, Blues and Bullets lacks a reason for its convoluted timeline, but I approve of the acting. Doug Cockle (Geralt from The Witcher franchise) puts on a decent performance as the worn and wearisome Eliot Ness, while the remaining cast will keep you asking, “Where have I heard that voice before?” The only ham-fisted portrayal goes to ol’ Al Capone, who speaks in a counterfeit Italian accent. That said, I enjoyed the bitter banter between the former rivals Al and Eliot, especially the option to shake Capone’s hand or punch him. The latter option I don’t recommend. Every Blues and Bullets character walks and talks with the grace of primitive animatronics, moving their mouths and limbs painfully against their wills. 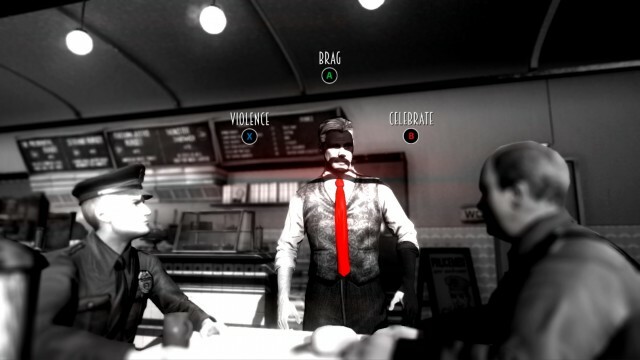 L.A. Noire set a gold standard for facial capture, yet studios still play catch-up today. If “The End of Peace” cribs anything intriguing from L.A. Noire, the investigation aspect is it. A loose end leads Ness to a potential suspect, a victim of a macabre mutilation. With teeth ripped out, hands torn off, and spikes impaled into the man’s body, players will piece the chronology of this gruesome execution together. How this homicide went down ignites Eliot’s former detective skills – he hasn’t lost his touch, whether or not I did. In scavenging for clues and stringing yarn around photos to deduce a motive, I did my best to analyze the murder without mistakes. Upon choosing irrelevant evidence, however, I learned there wasn’t a penalty for faulty solutions. This sequence won’t accept failure. You select the clues that fit the crime scene. If the proof doesn’t match the context (e.g., a car in the garage implies another witness, not the extent of mutilation), you simply select the next bit of evidence. You may have noticed, then, I haven’t talked much about the decisions you actually make. That’s because no meaningful choices – a critical feature of the adventure game genre – materialize in this episode. Blue and Bullets still introduces objects to ogle at and people to prod, and Eliot also acts aggressive, sarcastic, cunning, apologetic – whatever you elect – but many conversations exist in a vacuum. I expressed kindness to a knife-wielding stranger, lending him a couple dollars and sagely advice to risk a less troubled path. You could reprimand him instead, which leads to the man leaving Eliot’s diner in a hurry, too. You will not see warnings of “So and so will remember that” here. Another example: Although Ness names his price before he rescues Capone’s granddaughter – his money, exile, or imprisonment – Capone says he doesn’t care for his own future. Admirable, sure, though I sensed that exact apathy from Blues and Bullets gameplay-wise. The whole package is just slapped together haphazardly. Loading screens persist for more than a minute, and the frame rate stutters more than Porky Pig. Intermittent on-rail firefights fail to sync their sound effects properly, and on that topic, the aiming controls require tighter calibration and the enemies a greater intelligence – or at least the wisdom not to scatter propane tanks over someone’s estate. Even this episode’s dialogue – the bread and butter of Telltale’s series – contains clumsy pauses. A character speaks, then a second or two later, another finally responds. Will these disjointed issues plague Blues and Bullets for the remainder of its season? I’d hate to say yes. I adore the neo-noir artwork, the acting is on par with other adventure games, and while it demands explanation, A Crowd of Monsters evokes the potential to make something interesting of this alternate timeline. But will I endorse “The End of Peace” in its current form, without seeing whatever payoffs the second episode might deliver? Not in good conscience, no. Unlike the main antagonists, I’m no monster. This review is based on the Xbox One version of the game, which we were provided.